The brief was to design the company’s marketing brochure. The only fixed criteria (apart from a limited budget) were that it must contain a variety of projects produced by Storm and it must somehow express the company’s personality. The concept was developed with the whole company in mind and tried to include as many staff members as possible. The following examples show how the concept worked and spreads from the corporate brochure. Concept, design and art direction by Keith Vernège. 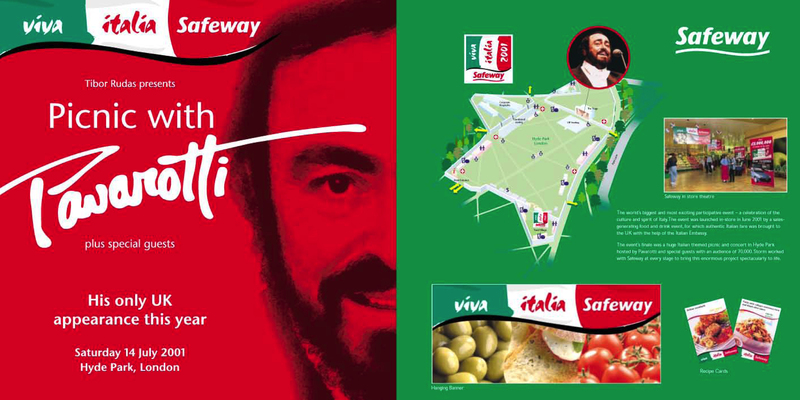 I also was one of three designers creating the concept behind ‘Picnic with Pavarotti’ in Hyde Park shown as an example double page spread.